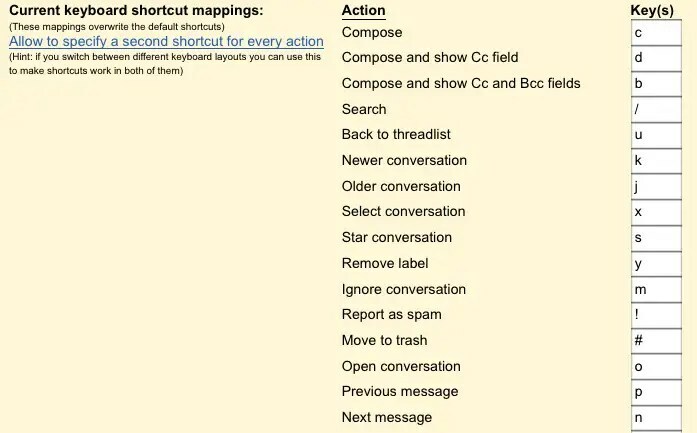 Reconfigure the keyboard shortcuts to do your bidding! Hit “N” to create a new email, ! to mark as spam…you can set any function to use any key you wish. Once I turned this the feature on, I found it hard to live without. I get tired of saying the same thing over and over and over again. The same questions get asked daily, and I send out the same responses daily. If only these responses could be generated automatically. It turns out they can! Enable Canned Responses and you can create standard responses to those pesky emails, saving you time and sanity. Reply, click to insert, and you’re done. Awesome time saver. 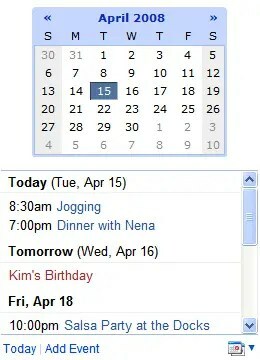 Normally your calendar and email are on separate screens. This doesn’t have to be! Enable the Google Calendar in Labs and you will have access to your calendar and schedule on the same page as your email screen. It makes coordinating meetings via email much easier. This is really cool. 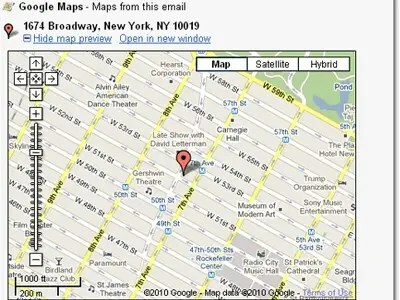 Turn on Google Maps Preview in Labs, and if someone sends you an address via email, it will automatically generate a map for you. Even cooler is if you read the email on a smartphone, you can automatically feed this map into your phone’s GPS and it will give you turn-by-turn directions to get there. It’s almost impossible to get lost anymore! Admit it — sending a text message from your phone is a big pain. You use spelling that would get your hands slapped in 3rd grade, you have to fumble around on a tiny keyboard, deal with your contact list…it ain’t easy. 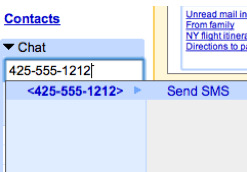 I’ve recently enabled SMS in Labs, and now I can send text messages directly from my email screen. All it requires is your Contacts to have a cell phone number listed. Can’t recommend this enough. It’s almost 5pm, you need to get a proposal out to your client before the end of the day, and you rush an email to him quickly. Unfortunately, after you hit Send, you noticed you referred to Mr. Monachy as “Mr. Monkey”. If you have the Unsend feature enabled, you won’t have to bother with an embarrassing apology: simply choose “Unsend” and your email will magically return to you. You can then make corrections and send it out the right way. Mr. Monkey will appreciate the effort. Previous Previous post: Microsoft Office 365 vs. Google Apps. It’s ON! Next Next post: Tech Curmudgeon: Invent a Problem, Sell a Solution!